It’s not easy taking pictures for you in some “ethnic” supermarkets. Sometimes I get permission from management, but frequently I can’t – not even if I argue that I’m promoting their multicultural store. At one supermarket, I was not only forbidden from taking pictures, but I think a security guard followed us around while we shopped to make sure I didn’t pull out a camera. At some places I’m happy to be with friends so I can pretend to take pictures of them while sneaking pictures of the store. Too bad. Each of these stores have good prices and great grocery shopping. 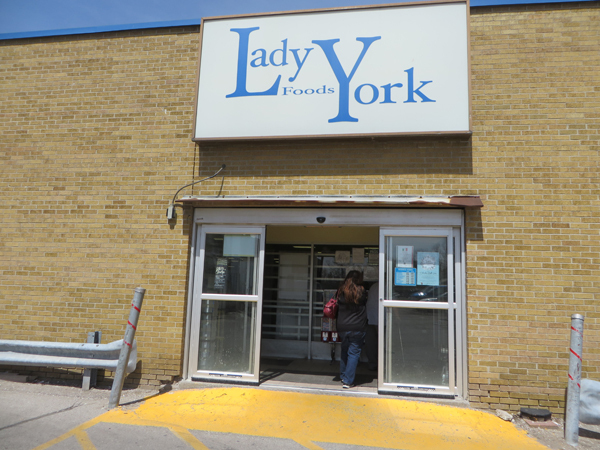 It was with much pleasure then that I accepted an invitation to a tasting event at the italian Lady York Foods at 2939 Dufferin Street. I assumed that I could take pictures and I was right. 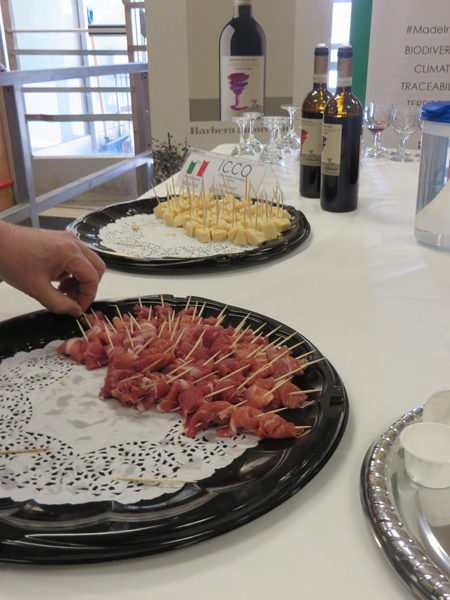 In addition, the store was giving away free samples of Parmigiano Reggiano and Gorgonzola – among my favourite cheeses. As it pointed out, these were the genuine “Made in Italy” version, not some Canadian-made variety. I never thought about what country was making my Italian cheeses. I’ll look at labels from now on. Also distributed free were Made in Italy prosciutto, espresso, wine, and cookies. With special discounted prices, how could anyone resist buying? Like other supermarkets, this store has many essential items. 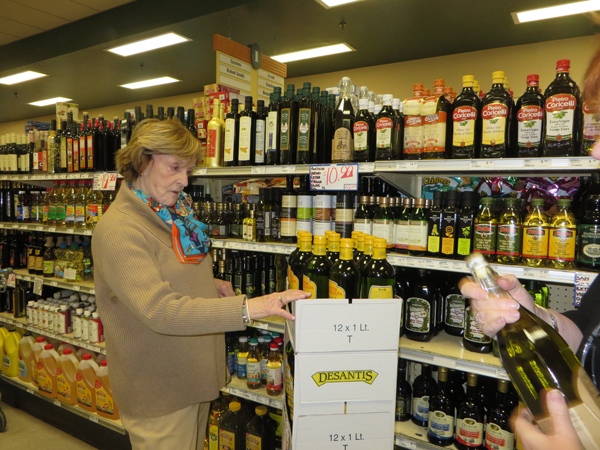 You can go there for most of your food shopping, but it has a larger variety of olive oils than many stores from which to choose; olive oils from Calabria and other regions in Italy, for example. Staff was available to help sort through the bewildering number of choices. I found more varieties of pasta there, both dry and fresh, than I’ve seen in any other supermarket, shapes, colours, and sizes I’ve never encountered before. Lady York even had its own brand of tomato sauces. 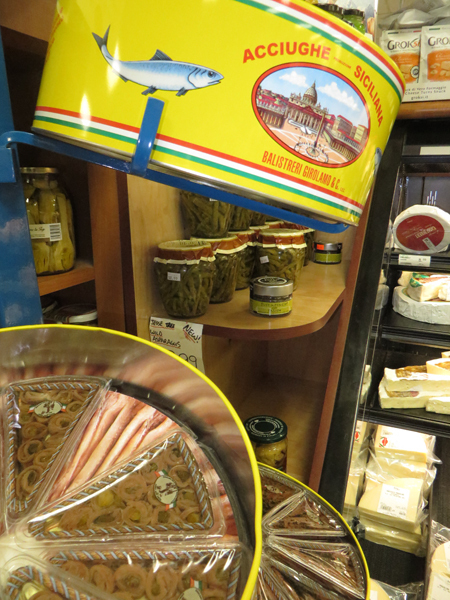 There was also many kinds of crusty Italian breads and bins of olives. 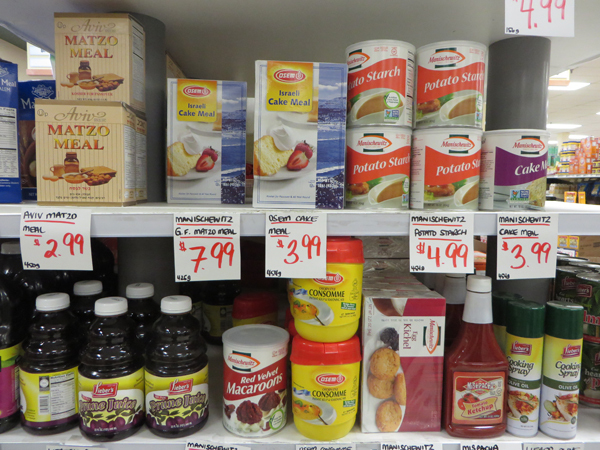 And I guess because it is in multicultural Toronto, it also had a shelf full of Israeli foods. Unlike the Middle-Eastern supermarket Adonis, I didn’t find any place where we could sit and sample some of the ymmy-looking pastry and the ready-cooked offerings. There just wasn’t room. This place on a Saturday along with a much-advertised promotion was crowded. But it was a fun place to explore with friends and if you can practice some restraint, it shouldn’t be an expensive outing. The Polish supermarket, Starsky Fine Foods at 2040 Dundas Street East, Mississauga, was larger than Lady York Foods. It claims 600 different types of cheeses – including Wenslydale, Mozzarella, Edam, Gouda, and many Polish ones. I found apples from Poland and different brands of Pierogies and Kefir. It gave out free samples of sausages. It too was worth a visit. A recent flyer from the huge Loblaws in Maple Leaf Gardens said that Loblaws “houses over 250 varieties of cheeses…” Only 250 varieties. Yummy at 4400 Dufferin St. is billed as “A European Food Experience”. Its signs were mainly in English, but some of them were in Russian. Free Russian newspapers and magazines were in boxes outside, so I guess you can call it Russian. It’s a little hard to find. You enter a mall at the Canadian Tire gas station south of Finch. Yummy has two stores in Toronto but the one on Dufferin Street doesn’t have a lunch room. We were told its branch at 1390 Major Mackenzie Drive West in Maple does have a place to sit and eat. It does have a huge selection of rye breads with samples, store-cooked soups, caviar, canned goose and duck foie gras (from France). It claimed “over 400 cheeses” and a huge selection of prepared salads (including crab Louis and egg plant). I remembered tables full of wonderful salads at meals I’ve had in Russian homes. It too was multicultural with fresh golden berries (Colombia), miso soup (Japan), and kim chi (Korea). Yummy also offered a large variety of teas with brands I’ve never heard of: Hyley, Greenfield, Ahmed, Akbar, Bob Marley. While it has many North American brands too, I saw goods from Turkey and Lithuania and other countries. You can see pictures of the store and its immense offerings at: http://yummymarket.com/from-our-kitchen/. 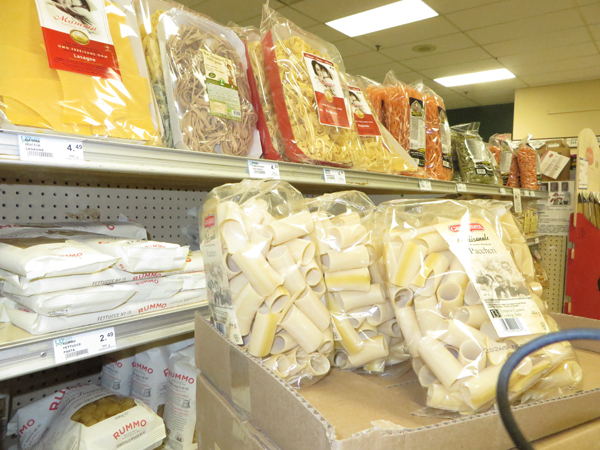 There are still many more “ethnic” supermarkets in Toronto than these to explore. We’ve already had blogs about the Middle Eastern Adonis, Iqbal, and Arz, and J-Town, Japan town. We hope to do blogs on the huge, wonderful Korean Galleria Supermarket, Chinese T and T, and the Iranian Plaza (Yonge Street south of Steeles) – these three with places to sit and eat hot prepared foods. There’s also Kostas Meat Market and Deli (Greek). We did try unsuccessfully to find someone to show us around several of these stores and let us take pictures. Please let us know of other supermarkets we’ve missed and tell us about your adventures there. Subscribe to www.torontomulticulturalcalendar.com above, and tell your friends about us. You can also get notices of our new blogs at www.twitter.com/#torontomulticul. Do tell us about your adventures in Multicultural Toronto. Don’t forget Marche Istanbul (Turkish supermarket) at Orfus Road and Dufferin and the many cool places to eat at Downsview Mall on the weekends. I just received a helpful email from ” Mary”. Thanks to her and Elizabeth for taking the time to share their experiences with us. Mary writes: “Another name for your ethnic grocery stores is Khorak at 6125 Yonge street, in the Iranian plaza area. They have just extended the size of their store. I was there a week before the Iranian new year and it was like being transported to another country. Wonderful atmosphere and foods!